Security Blinds and Shutters offer a high resistance option. They are constructed to prevent even the most determined intruder if required. This may not be high on your budget considerations – that is until you get broken into. Most of the calls we get are from businesses that have been broken into. They realise only too late that the protection they need to secure their building and assets could also save their business. Aluminium security shutters combine strength and style, allowing you the opportunity to offer clients an aesthetically pleasing solution, without compromising security. Steel security shutters are installed in large span commercial applications (20m2+) and wherever fire protection is a must. Insulated security shutters are popular in domestic and light commercial applications, offering heat and sound insulation. High strength extruded aluminium and steel security shutters are utilised in medium – high security domestic and commercial applications. 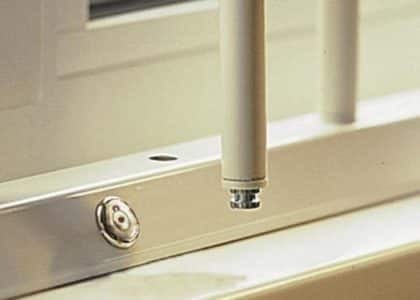 Security Grilles retract fully to allow 100% access to doors and the full opening of windows. Innovative design and the use of modern manufacturing techniques has led to the development of the high specification range of retractable security grilles that form an effective barrier against intruders, whilst retaining the appearance of the building that is being protected. Roché retractable security grilles provide excellent physical protection at many different levels of risk for domestic, commercial, and government use. The comprehensive product range includes various security level options dependent on application. Fixed grilles offer security without an opening facility. Roché has also introduced a range of fixed window screens designed to offer a combination of vandal resistance and security. Contact us to find out more.